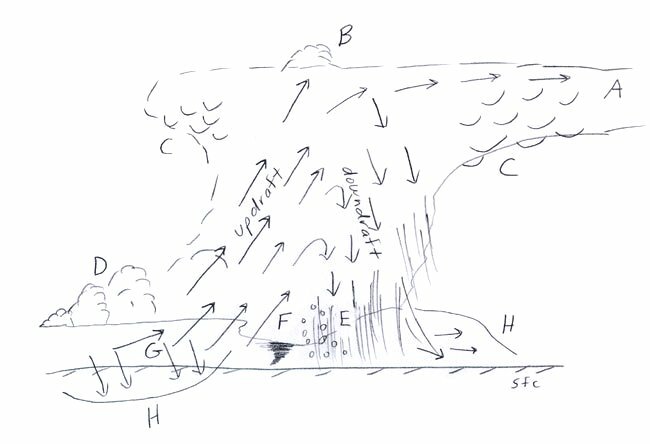 The core of the updraft has the strongest convective upward vertical velocity. This core of rapidly rising air will only slow down and stop when it encounters a very stable layer in the atmosphere. This very stable layer is the tropopause. Air will rise as long as it is less dense and therefore more buoyant than surrounding air. The faster air rises the longer it takes generally to slow down and stop once it encounters a very stable layer. This occurs because a moving object has momentum. That part of the updraft that has the greatest momentum will form the overshooting top on a severe thunderstorm. The diagram below shows the overshooting top at "B".